Striker Florin Andone described Brighton & Hove Albion’s victory over arch rivals Crystal Palace the ‘perfect day’ on Tuesday. The Romanian international came off the bench to replaced the injured Glenn Murray after 35 minutes and he made it 3-0 late in the first half with an outstanding solo goal. Andone won possession on the left touchline, skipped past James Tomkins and even when it appeared Tomkins had got back to clear Andone nipped in to score past Wayne Hennessey. 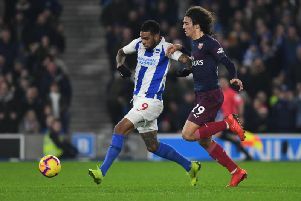 Albion played with ten men for more than an hour after Shane Duffy was sent off for violent conduct shortly after Murray had put Brighton ahead from a disputed penalty. Leon Balogun made it 2-0 moments after Duffy’s dismissal, before Andone’s goal sent the Amex crowd wild in the final seconds of the first half. Palace got a late goal back through Luka Milivojevic’s penalty but Andone – who had netted the winner on his first Albion start at Huddersfield on Saturday – was delighted with the performance and all three points. He said: “The most important thing is the victory. It was very hard with one man less but I think we deserved the victory. Andone’s wonder solo goal was one of the main talking points after the game among Albion supporters. He said: “Maybe I surprised the defender with my speed slightly because he didn’t know too much about me and I’m new in this division. On the importance of his goal just before half-time, Andone said: “My goal was very important given how close it was to half-time, it was a bit of a surprise, but it was unbelievable to go in at the break three goals up in those circumstances. “At 3-0 at half-time, you need to keep the result and to be careful but you need the second half to be horrible to lose the game. “We played very well and we kept the result. “It was a perfect day, it’s very important for us this victory. The most important thing is to be far away from the bottom three positions and now we think about the next game. Andone had a frustrating start to his Albion career owing to injury. The summer signing from Deportivo only made his debut last month but he said: “It was hard for me at the start – I didn’t play for four months, but that’s in the past now and for me it’s about the future. Looking ahead to the rest of the season, Andone said: “It’s always normal to look up when you’re in good form but we have to be careful and work day by day. “We have to be realistic and humble – we have to continue working hard every day. “I’m happy for this side because we’re a very good team who work hard to keep our shape – there’s a good spirit here and I’m very happy for this victory, for the six points in four days.